Matsubayashi-ryu is a MARTIAL ART in which we try to put more emphasis on the aspect of the ART than on its martial support. The martial techniques are used as tools to follow the “way” of the art. 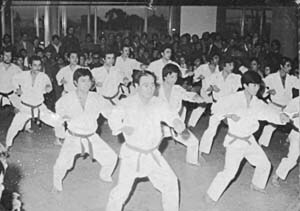 In his book The essence of Okinawan karate-do, Grand Master Shoshin Nagamine synthesises this essence in the phrase: “Karate ni sente nashi” (there is no first attack in karate). Evidently this phrase contains a spirit of peace and no aggression. However, to support the true meaning of this phrase, it is fundamental to do away with our lack of tolerance and to stimulate our broadmindedness to the maximum possible extent. By joining our mind and body intimately together and putting our aim on perfection, we will gradually perceive that the techniques will emanate from “Ku” (a condition completely free of ties). Class with a group of students (Year 2006). 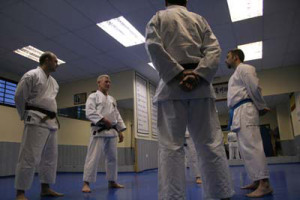 Sensei Camani puts emphasis on the importance of Hara. For this to be possible, the “Ku” must be “empty” or free, nothing exists in “Ku” whilst everything comes from it. We must be able to relax completely, without any muscle tension, we must only remain in alert. It is true that one of the main objectives of the practitioner is to perform each technique with absolute precision; however, the artist must go beyond this point. The objective is to perform the techniques without thinking, feeling a real flow of energy. The centre which generates this flow of energy is the “Hara”, i.e. part of the body which surrounds its centre of gravity. Duality must disappear and the small “self” is to be disregarded. All our being (body, mind and technique) must emanate from “Ku” (“nothing” or “emptiness”). At this point we will discover that the techniques that oppressed us for so long, will finally give us freedom. This achievement is enriched by a better comprehension of ourselves as well of the world. Thus, the objective of is to increase wisdom, it becomes a “way of life” rather than a way to train our body. We must point out that one important characteristic of the school is the non existence of tournaments or competitions.